How do I create a dump file when the program freezes or hangs? Click the Processes tab, and then find the name of the process. The name is depends on your CyberLink program. 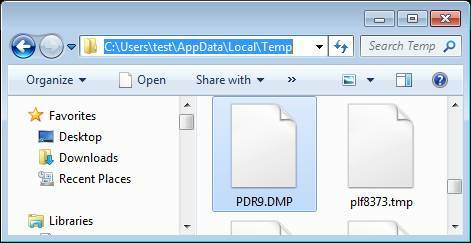 For example, PowerDVD is similar to named PDVD.exe, and PowerDirector is similar to PDR.exe. Right-click on it and then click Create Dump File. 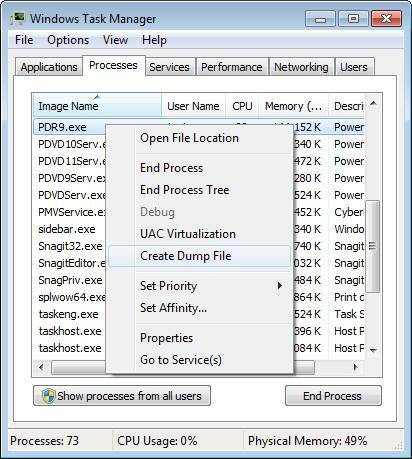 After the file is created, go to the following folder specified in the Dumping Process dialog in Windows Explorer to access the dump (.dmp) file. Note: If you cannot find the folder AppData, click here to see how to show the hidden folder from the Microsoft web site. Please compress the created .dmp file as .zip or .rar and send it to us. Note: You can also refer to the article here for more info from the Microsoft web site. Please compress the .dmp file as .zip or .rar and send it to us. What is the difference between crashes, hangs and freezes?